There are plenty of vehicles available for sale-that is for sure. However if you have a large family, you need a big vehicle to comfortably hold everyone when you travel. While passenger cars generally hold about 4 to 5 people, carrying people just isn’t enough, what about plenty of gear like baby strollers and carriages, kids toys and work tools. These are some of the reasons that it makes sense for larger families to purchase a big SUV. Here are two vehicles that definitely deliver. 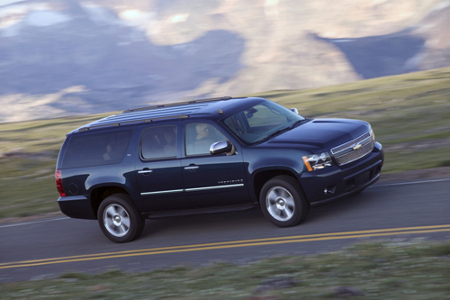 The Chevy Suburban is one of the largest SUV’s available. And while it has been around as a nameplate for decades, today’s Suburban definitely fits many comfortably. Whether you are looking for plenty of space for people or gear, you will find it with the 3 row Chevy Suburban. While the Suburban is not cheap, usually starting in the mid 40’s and going up to 50K or more, you do get plenty of practicality and functionality from this vehicle. Besides a large engine, expect plenty of towing and hauling power to boot. In addition, there are lots of amenities that make the Suburban perfect for cross country traveling or just the weekly drive to grandma’s house. 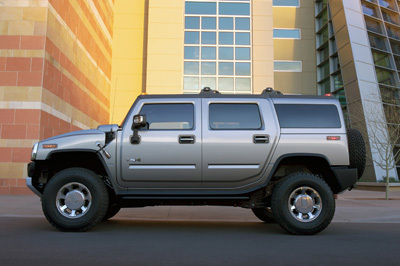 For those families that are not only large, but are sport focused, a great vehicle is the Hummer H2. The H2 might not be the most economical vehicle on the road, but for larger families they definitely make sense. Plus, if you like to enjoy plenty of outdoor sports, getting their and hauling all your stuff to far off sites is quick and simple. The Hummer H2 can be very expensive- over 40K for sure, but for those that what plenty of power, room and 4×4 oomph, you can’t beat the Hummer name plate.